You may remember back at Christmas time I shared a lovely Joy wreath sign with y’all. Weeeell, I loved it so much (that I still had it on my deck until last week) I had to make another! Of course joy isn’t exactly an appropriate word for this time of year so I had to put my thinking cap on. 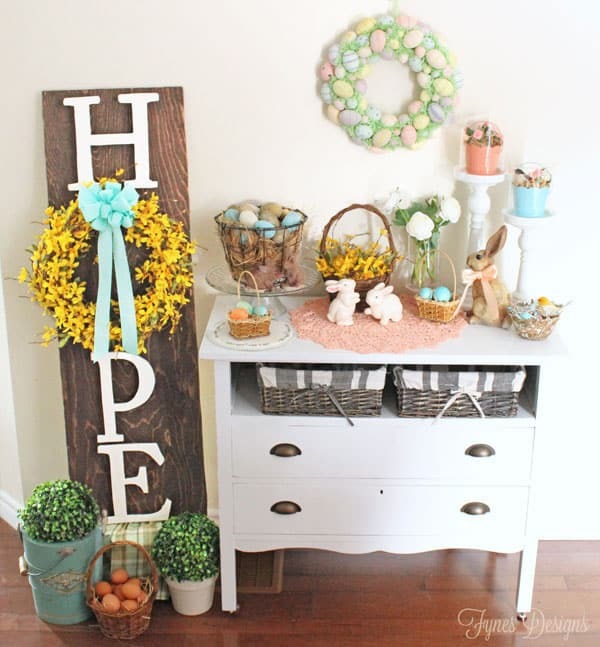 Could a Hope Easter Wreath sign be any more fitting?! I stained a 1/4″ sheet of plywood with Walnut Minwax Stain, and added the plywood letters I cut using my jig-saw. Note- don’t be crazy like me and cut your letters, just go to Michaels and get the pre-cut ones, it was crazy town! 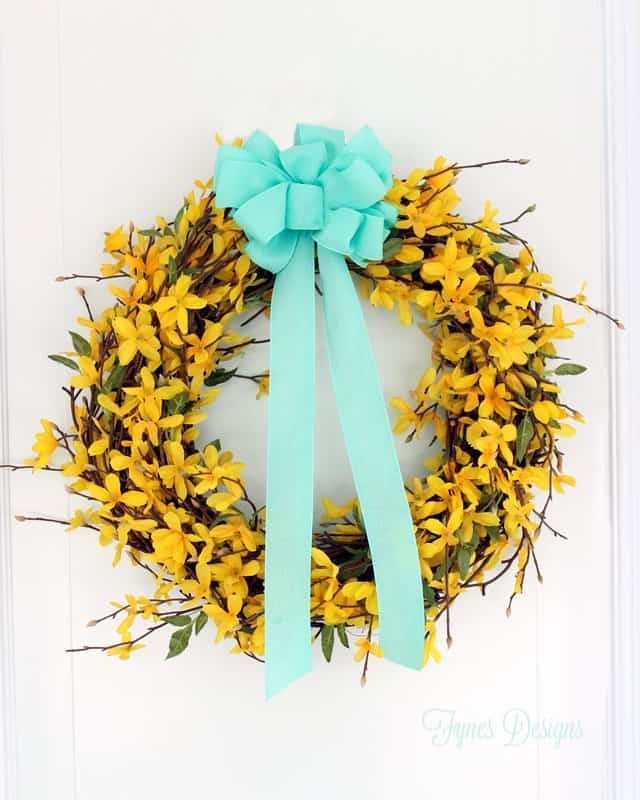 The forsythia wreath I made of course looks stunning on its own without the sign. I dressed it up with a Seafoam Faux Linen May Arts Ribbon bow. 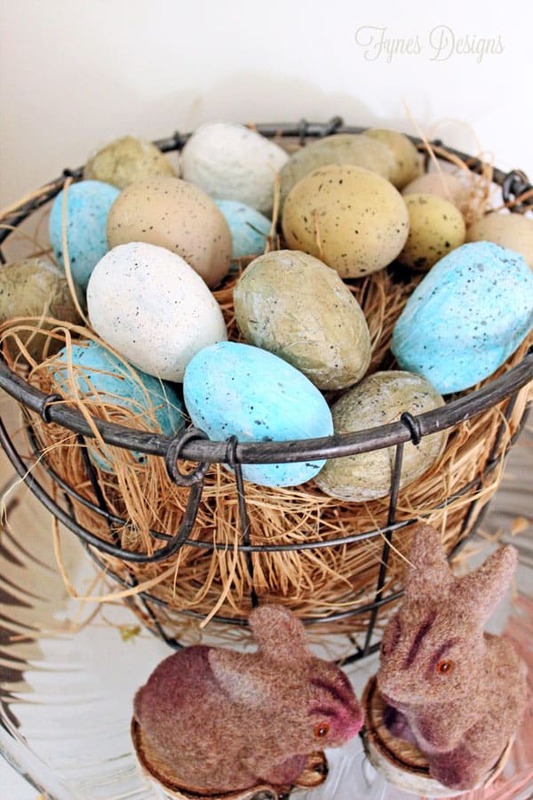 To add to my Easter vignette I decoupaged plastic eggs with blue, gold and white tissue paper. When they were completely dry, I flicked a bit of black acrylic paint at them (I guess poop splatters make them look more authentic?). I picked up the awesome wire basket at the Wicker Emporium. Peter Rabbit here is one of my favourite Easter decorations. Each year I give him a new bow tie, this year its a soft double faced peach satin. You can see what he wore last year here. 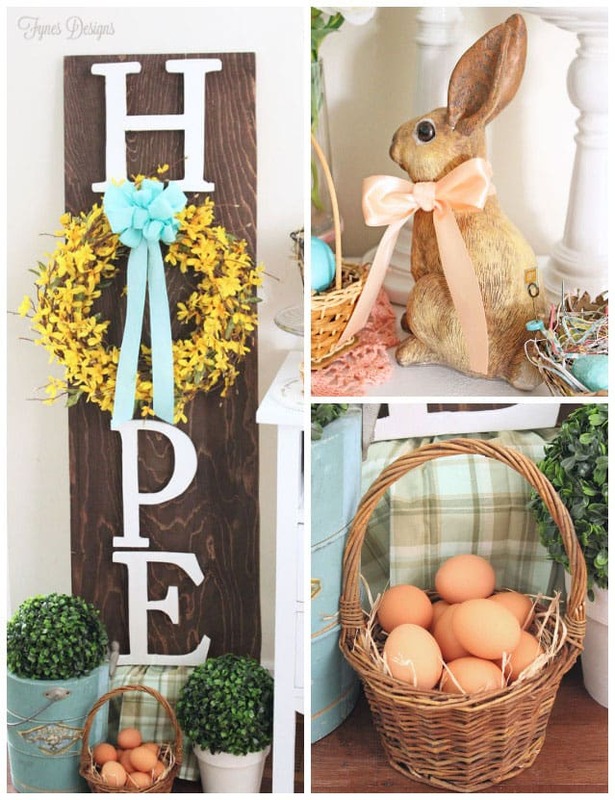 Thanks for hopping by to check out my Hope Easter Wreath Sign. Please continue hopping and leaving some love along the way! 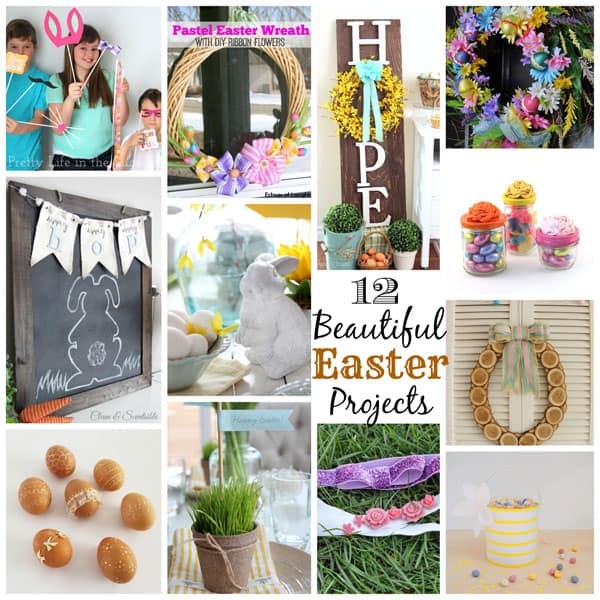 We have a stunning line up of Canadian Easter projects for you! What an Easter set up! I really love the simplicity of your wreath and such a unique idea to use it as a letter. Like your Christmas one, this is gorgeous. The word HOPE is very fitting for Easter! Love the yellow and blue and the way you styled it all. Great job! This is beautiful V! I love the HOPE for Easter…it’s perfect. Have I mentioned how endlessly talented you are!! I am often inspired when I read a blog but it isn’t often that I am touched. With your wonderful writing and photographs I am both. I am always so impressed with your creativity and I so enjoyed reading the story behind how you came to crete such a beautiful piece. Thanks for the advice about just picking up the letters at Michaels. Power tools and I are not a good mix! HOPE is a word we have to have here in Nova Scotia this year! Here’s hoping spring will come soon! I’m heading down to the basement to find my Easter decorations. You have inspired me! You’re so sweet Angie, thanks for stopping by! SO pretty! I love it-especially with the yellow wreath. You cut your own letters??? Damn girl that is impressive. I just mastered using a drill last year. Beautiful work as always! So I’m thinking you need to make a sign like that for me! LOVE IT!!! Pinned!!! Hey Girl! It’s Deonna from the Child at Heart blog. I was just stopping by to say hello! This HOPE sign is so happy and cheerful. That yellow is so fun! Love it. Pinning! I am doing a great spring necklace giveaway and would love for you to come by and enter to win 🙂 Have a joyful week! Virgina – i would love to make this for RELAY 4 LIFE. Can you tell me how you attached the letters and reef? Hi Sydney, THe letters are attached with screws going from the back side. There are small wood blocks between the letters and the sign to hold the letters away from the sign. Hope this helps, I’d love to see it when you’re done! Thank you! Can’t wait to get started. I will pin my picture. Virginia. Thanks for the amazing idea. Mine did not come out quite as good as yours but non the less it will go at Relay 4 Life. I’m so happy to hear you used the idea! I can’t wait to see your version! I’m late to the party but oh my goodness I love your hope sign so much! I must make one! Do you mind telling me the height of each letter & the diameter of the wreath? I absolutely love it. You are so talented! I think I’m also going to paint 4 Mason jars and stencil the letters onto each jar into a design that’s similar & give them as gifts. (To be used as vases.) 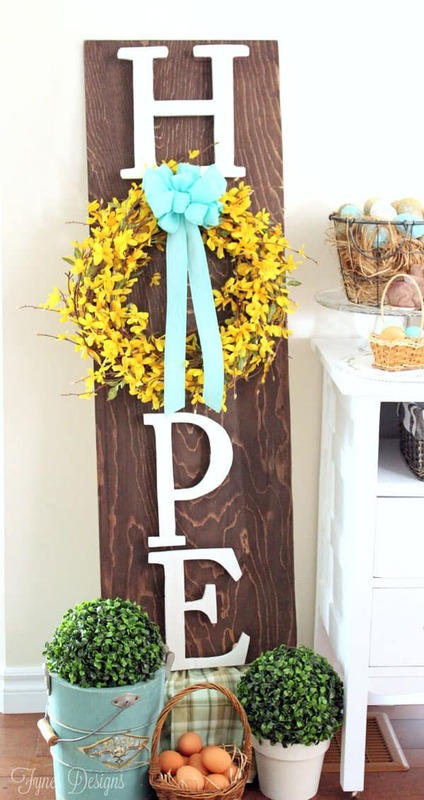 After experiencing a very hard year & my Mom just recently being diagnosed with cancer, it’s the perfect word & ive been trying to figure out how to incorporate more Christ centered easter decor. It is perfect. Thanks for the inspiration! Thank you so much Kendra. The wreath was 12″ and its now put away but I’d say the letters were approx 10″ high. Your idea sounds great!